I am in the above picture, as is my friend Hilary Parnell (nee Perkins). I would be interested to hear from any others who recognise themselves! I am directly behind Mr Povah and Mr McNelly, Beside me to the right is Barry Dannenberg then Richard Beale. I am Robert Shade. I recognize several others. The photo is only a third of the actual width. I remember Mr Povah checking the composition of his school from the photographer's position. In his haste to get to his seat his gown which had become entangled with one of the camera tripod legs very nearly upended the panoramic scan camera and caused a partial sensation. Pure pantomime! I have an original copy here in New Zealand although the rats got to it one time and several of the teachers met an untimely demise. I think I must have been in the original somewhere. I'm afraid my copy is now lost. I remember Roger Ellen very well. Having had another look I think I recognise Richard Wrigley, 4th from the left in the back row. His sister married my brother which doesn't make him my brother-in-law! I would love to see the original. I was in Year 5 in 1962, but cannot see me in the picture. ROBERT SHADE if you have a copy of the original could you please send it to me. To who it may concern, I have a mint condition silver and enamel watch fob with FINCHLEY COUNTY SCHOOL on the front. It is hall marked. I also have an identical one which is of a silver coloured metal. I believe they were from the year the school was founded in 1903. Please contact if you are interested. I was present in 1962 as a fourth year (Helen Bell) when this photograph was taken but I was in the missing left hand section (which is in this archive as picture no 1350). In the back row of this middle section of the picture, I recognise Richard Wigley (4th from left), John Gregory (8th from right); Robert White (who was to become Head Boy) - 11th from right; next to hime is Roy Bentley (11th from left). It may possibly be David Eckett at 9th from the left. This must have been the last school photo including Mr Eldridge, our inspirational Geography master, who passed away just before our class took our Geography O Levels in 1963. 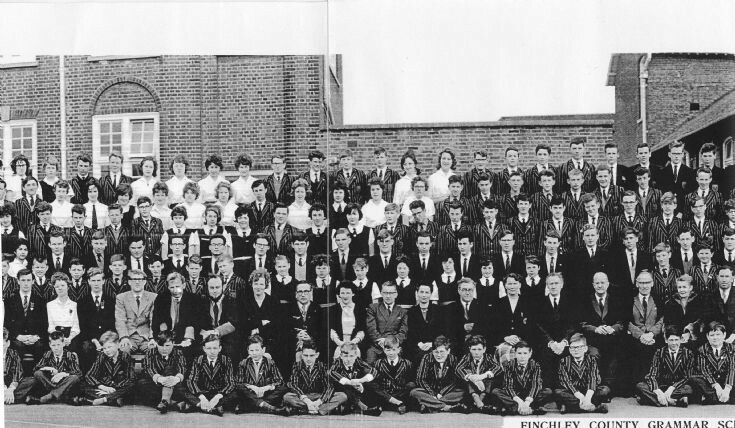 I have an original copy of this photograph as well as the 1965 version where we were all Prefects in the same row as the teaching staff. There is a full copy on the FCS website. Remember all of you! Long time ago now! Well, what do you know... there I am slap bang in the middle, second row down just to the right of the fold in the photo! Jennifer Musk is on my right, Judith Dowse on my left. I still have my copy of the original. Mr Povah must have been there since Adam was in short pants! I was at this school from 1955 until 1959. I'd love to hear from anyone who was at school, especially Carole Franklin and Gail Purnell. Yes, I am in this photo too, the second row back behind Mrs Gabe and Mr Eldridge. Just returned home from attending a brilliant Re-Union, even though there were only six from my year there. Will make a really big effort to contact more from our year to attend the next one. Thank you Ian Smith for organising today. That should read Ian Thomas and not Ian Smith - bad 'Senior Moment'!! does anyone know the whereabouts of Gail Fromson who was a pupil at the school from 1957 until 1962/3? Gail was in my class Roger (I remember you too), she started in 1958 and left in 1963. I also went to primary school with her. I did see her once, when I was visiting UK in the early 70's but haven't heard anything about her since. Hello, Roger. I remember your name but I can't place your face. I don't know if Gail emigrated but I do know that Gillian Collins did. She was one of the £10 poms who went to Australia. I now live in Aylesbury, Bucks. Good to hear from you! Hi, I'm in the photo top row, 4th in from the right. Did you used to live in Court House Road, near the dip in the road. I lived nearly opposite, but was about 5 years behind you.